Since its foundation at the mouth of River Neva St. Petersburg has been the harbour through which western ideas were imported into Russia. The eighteenth-century Baroque or Neoclassical palaces and the endless avenues are the historic facade that served as gateway for European taste. The architectural renovation that turned the city into a cultural and political continental hub came with a cost: the complete removal of folk architecture. Wood construction at the time carried a certain burden of shame, never better expressed than in faux brick painted on the log cabin that hosted Peter the Great in the beginnings of the foundation. Even to this day, the foundation goal left on St. Petersburg the indelible mark of being a door-city. Therefore, it might come as a surprise that, facing the challenge of creating an innovative model for the country house of the region, this proposal seeks an earlier tradition. A paradox that is only apparent, because the interpretation of folk architecture is already generalized in Europe, becoming, in our view, the most exciting of current trends. 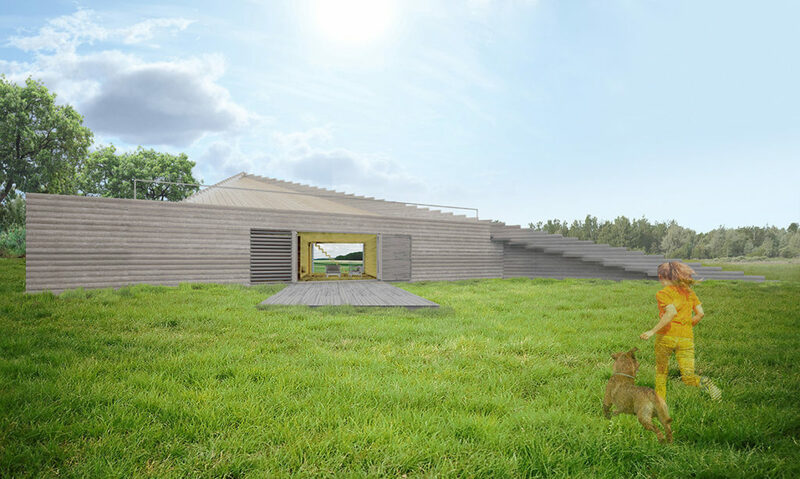 With regard to the log cabin, its recovery not only honors vernacular architecture, but also responds to the economic and environmental challenges of our time. But Phalcon House not just emulates, it collects and reinvents the art of northern carpentry masters through a contemporary glass. The triangular foorplan is not gratuitous. It was chosen out of an exercise of containment -another of the competition requirement-, as it is the minimum livable polygonal figure. The difference in heights allows each of its three facades to be unique and distinct. Inwardly, the layout responds to a scheme of parallel strips that widen towards the base of the triangle. The first strip is the narrowest, it acts as a filtering access to the house by containing the entrance and the garage. On the second strip lies the core of the home: a traditionally inspired open concept dominated by a central fireplace around which the entire house is organized. The living room has two alternating orientations, during the summer opposing windows completely ventilate the house, while in winter the focus is on the fireplace. In the last strip, reaching the bottom of the house, we find the most private rooms, such as the bathroom and bedrooms. 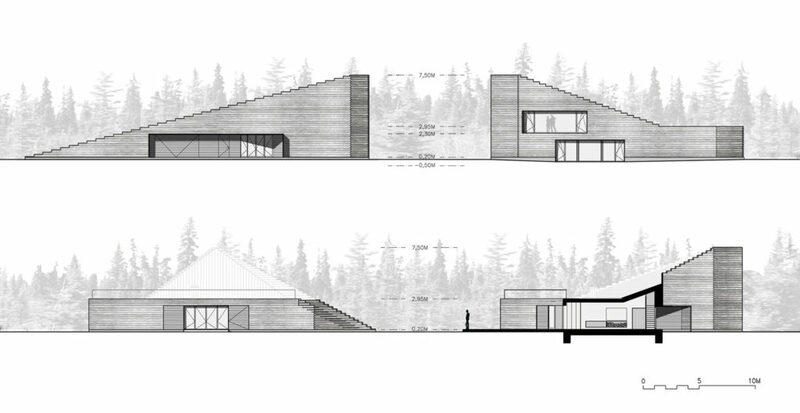 The scheme applies to the top floor, where the main bedroom overlooks the forests. 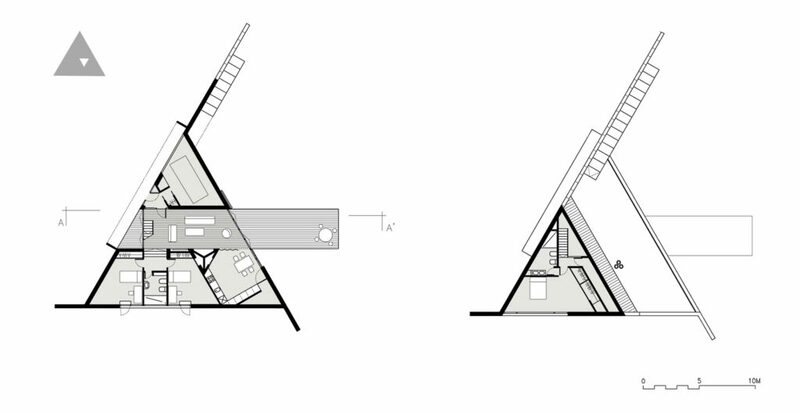 Although conceived as a singular house, there is nothing in the proposal preventing a larger scale use. Serial grouping can be efficiently achieved by placing the house over an equilateral triangle plot. 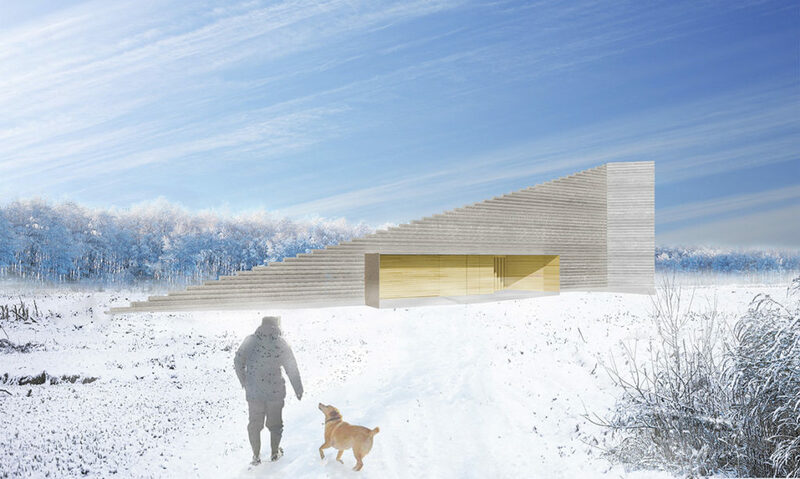 In increasing scale, from the fireplace to the neighborhood, the proposal is a strenuous geometrical exercise in which reversed and circumscribed forms gravitate around the warmth of the home.